Personnel: Zack Clarke: piano, electronics; Charlotte Greve: saxophone, clarinet, flute; Chris Irvine: cello; Nick Dunston: double bass; Leonid Galaganov: percussion, waterphone, shakuhachi. 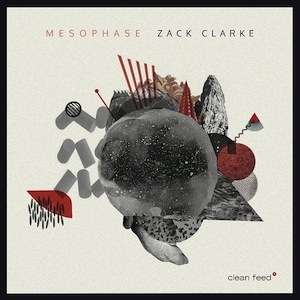 Pianist Zack Clarke, an inveterate explorer who likes to push musical boundaries by distilling his creative ideas into new music, has a new album where electronic and acoustic elements converge in an attempt to sonically portray daily life in New York City. Mesophase, the follow up to Random Acts of Order (Clean Feed, 2017) is another challenging recital given in the company of other artisans of the textural invention: Chris Irvine on cello; Charlotte Greve on saxophone, clarinet, and flute; Nick Dunston on double bass; and Leonid Galaganov on percussion, waterphone, and shakuhachi. The majestic opener, “Curtains”, shows the group immersed in thematic abstraction with entangling segments that meld contemporary chamber jazz, modern classical, and traces of world music with decorative electronic sounds. The initial fluctuations between flute and cello generate some forlornness that vanishes when the pianist incurs in a faster, bolder and continuous countermove that can be described as a blizzard of patterned replications. “Generative” ruminates till the end, swimming in contemporary classical waters whose reoccurring streams have the sonic oceans of Messiaen and Reich as sources. Here, the drummer’s sketchy drawings are palely colored by the clarinet. A rich cello sound resonates in consonance with Clarke’s pastoral pianism on “Beggar”, where the procedures feel a bit more grounded and less uncertain. Rimsky-Korsakov’s “Flight of the Bumblebee” came to my mind as soon as “Tilted” began. Lots of tension was put in the harmonic progression, taking us to an avant-garde realm that we recognize. Still, the exploration continues with other creative aesthetics. “Reticence” carries a jazzy vibe that comes specifically from the often-motivic piano, ably supported by the responsive bass/drums accompaniment. This frenzied clarity mutates gradually as Greve takes over on flute. “Frontier” sounds like a cogitative chamber crusade enlivened by a pulsating bass pedal, entering in a dulcet pianistic suspension in its concluding section. A similar unbind sentiment can be extracted from “Bridge”, an Arvo Part-ish exercise that glows with saxophone lines over the ebbs and flows created by the pianist. Density and space permeate the conceptual Mesophase, which is not for every casual listener. Still, you might be able to find profundity in complex passages leading to further discoveries.